Members of the VGG at one of the small group meetings in Mexico. Emeritus Professor Michael Day (chairman) second from right. The World Small Animal Veterinary Association Vaccination Guidelines Group (VGG) last month held a series of meetings and continuing education (CE) sessions in Mexico—the final country visit in its three-year project aimed at enhancing levels of understanding of infectious diseases across Latin America and advising veterinarians on ‘best practice’ in vaccination. 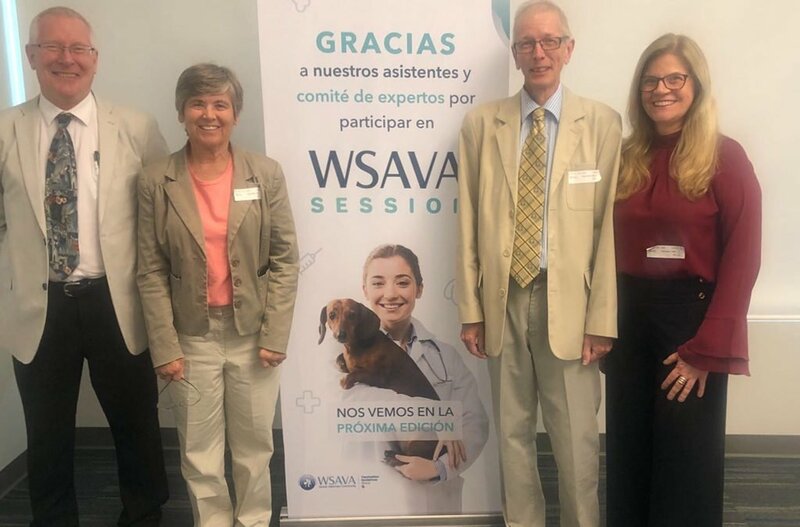 Committee members, including VGG chairman, Emeritus Professor Michael Day, met with veterinary association leaders, academics, first-opinion practitioners and government regulators in Mexico City, Guadalajara and Monterrey. They also made site visits to practices in all three cities. The VGG develops globally relevant recommendations for best practice in the vaccination of dogs and cats. It has also created the WSAVA Global Vaccination Guidelines which sets minimum standards for care and recommending best practice in key areas of veterinary medicine. “The VGG was delighted with the success of this visit to Mexico; a country with an estimated 45,000 veterinarians with students graduating from approximately 45 public and private veterinary schools,” Emeritus Professor Day said. “Mexican veterinarians are accustomed to the principle of annual revaccination of dogs and cats with multicomponent products, but those we spoke to were excited by the new concepts of less frequent and individualised vaccination, incorporated into a preventive healthcare package for pets.